with Student Bandmaster arm badge. Tunic with arm badges and buttons, trousers, plaid, waist belt, spats and brogues. Pill box with badge. No. 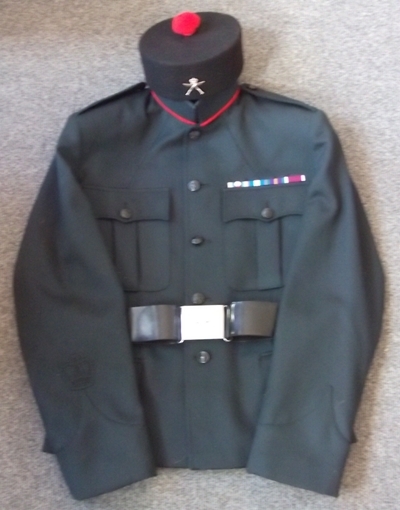 1 Dress tunic with red piping on collar. 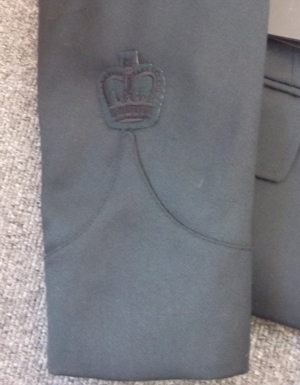 Embroidered crown on sleeve for Sergeant-Major. Medal ribbons above breast pocket. Black QEII buttons. Chest 39 inch. kilmarnock hat cap badge. Black plastic waist belt with buckle (camera did not pick up badge). No. 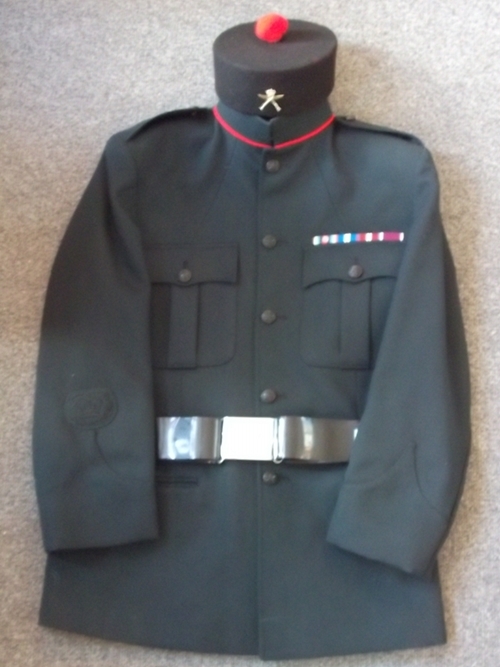 1 Dress tunic with red piping on collar. 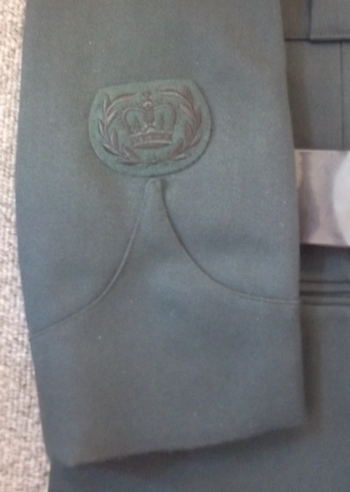 Embroidered crown on sleeve for Regimental Quartermaster Sergeant. Medal ribbons above pocket. Black QEII buttons. kilmarnock hat cap badge. 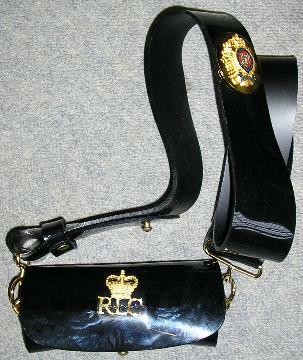 Black plastic waist belt with buckle (camera did not pick up badge). Plastic belt with white metal fittings. The eagle badge was originally worn as an arm badge by the 6th Gurkha Rifles to commemorate serving alongside the 14th/20th Hussars in Italy during World War Two. In return, the 14th/20th Hussars wore a crossed-kukri badge on their arms. Plastic belt and pouch with metal fittings. 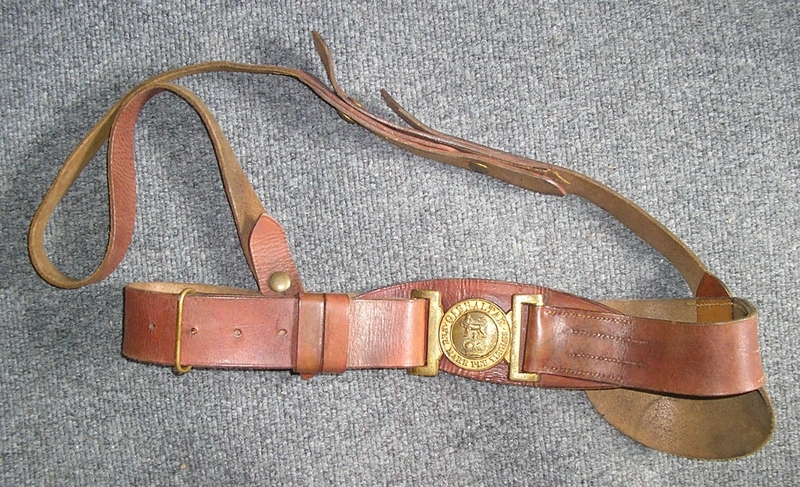 Belt is 3 inches wide and with the pouch attached is approx. 21 inches long. Boots have spurs fitted and gilt knot and braid around top. Boots made by Bartley & Sons, Oxford Street, London. Inside both boots is written: 108474 E.R. Broadbent 8th Hussars. (the E has a large top loop and small lower loop). Edgar Richard Broadbent was commissioned in the 8th Hussars in 1902 in WW1 and was awarded the MC (London Gazette 1 January 1918). Major Broadbent died of influenza 31 October 1918. Laced legs. Waist approx. 30 inches and inside leg 24 inches. No labels. Made by Fox of Wellington, Somerset. 190 cm long by 11 cm wide. Small button at end, stamped L FOX. Rank insignia for a Lieutenant-Colonel. In excellent condition. Old skin without eyes and has been patched over time. With Lance-Sergeant stripes on sleeve. Chest 38. In very good used condition. Jacket is 46 cm across shoulders. Sleeve (cuff to shoulder) 57 cm. Waist coat is 47 cm across the front of chest. All in good condition. Made by Michael Jay, Stowmarket. Jacket is 44 cm across shoulders. Sleeve (cuff to shoulder) 65 cm. Warrant Officer's badge on sleeve. Jacket is 47 cm across shoulders. Sleeve (cuff to shoulder) 62 cm. Jacket is 47 cm across shoulders. Sleeve (cuff to shoulder) 66 cm. Crossed kukri badge on sleeve. Tunic and trousers. Name inside tunic. Rank badge on arm and medal ribbons on tunic. Jacket, waistcoat and trousers. Jacket has collar badges, Major's crowns on epaulettes, Croix de Guerre ribbon on sleeve. Across shoulders measures 15 1/2 inches. Sleeve is 25 inches from edge of shoulder to cuff. Waistcoat is approx. 34 inch waist. Trousers approx. 34 inch waist and 32 inch inside leg.